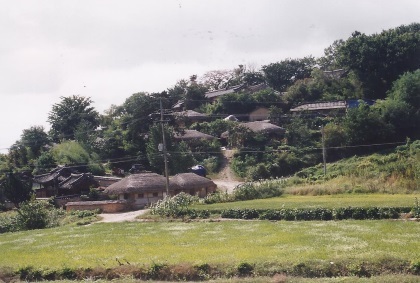 'Historic Villages of Korea: Hahoe and Yangdong' comprises the two most representative historic clan villages in the Republic of Korea. They preserve Joseon-style architecture, folk traditions, valuable books, and the old tradition of clan-based villages. 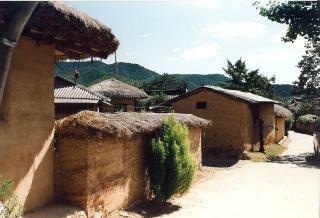 Hahoe Folk Village is located in Andong. The village is organized around the geomantic guidelines of pungsu and so the village has the shape of a lotus flower or two interlocking comma shapes. The Byeongsanseowon Confucian Academy is also part of the core zone. Yangdong Folk Village lies in Gangdong-myeon, 16km northeast of Gyeongju. The village has over 160 tile-roofed and thatched-roof homes built throughout the dense forest. Fifty-four historic homes over 200 years old have also been preserved. Included are three clusters: Yangdong Village, Oksanseowon Confucian Academy and Dongnakdang House, Donggangseowon Confucian Academy. On my trip to South Korea in 2001, a trip that lasted only 2 weeks, I visited the country's all 8 WHS. And a number of other nice places - the distances within South Korea aren't that far, and it's an easy and rewarding place to travel in. Two of these sites now have become a WHS in 2010: Hahoe Folk Village and Yangdong Folk Village. The bus ride to the Hahoe from Andong takes only 35 minutes. The very well preserved village "Hahoe" appeared still in deep rest when I approached. At the town's entrance is a ticket gate, otherwise it is an ordinary village. The weather was wonderful, the town smelled just how a rural site should (after manure). A wonderful quiet place. Almost all of the thatched roof houses here are still occupied, so it's not possible to look inside them. Hahoe is especially known for its mask dances. From the village it's a 2 kilometer walk to the Mask Museum. About 200 Korean masks are exhibited: a glimpse into the folk history of this often so westernized country. I also visited Yangdong. This village is located near Gyeongju. I was the only passenger in the local bus, and the driver dropped me at a crossing from where I had to walk another 1.5 km. However a car stopped after a few minutes and gave me a lift - that happened so often in Korea! There was no entrance fee to be paid in Yangdong: it was just a peaceful and very quiet village. Also less accessible than Hahoe, without a map or a guide. So I just walked around for an hour or so before returning to the bus stop. At the time I surely wasn't aware visiting possible WHS, but I always do have a soft spot for these "folk villages". So I'm happy that I see them rewarded WHS status in 2010! I visited this WHS in April 2017. In Seoul I caught the Line 2 subway to Kangbyun Station. From Exit 3, I headed to the East Seoul Bus Terminal and bought an intercity bus (Tago) to Andong for 17100 won (2hrs 40mins) instead of a Korail train ticket which strangely enough takes longer (3hrs 15mins) and costs around 24000 won. Arriving quite late in the afternoon and travelling with luggages, we decided to catch a 30 minute taxi instead of waiting for the 50 minute bus ride to Hahoe and having to walk to our hanok. This way we also avoided paying the 3000 won entrance fee since we were sleeping there and got there in time for a splendid sunset. For dinner we had the local speciality, Andong-jjimdak (steamed chicken and glass noodles with various vegetables marinated in a ganjang based sauce) and a shot of Cho Ok Hwa folk liquor or Andong soju. Hahoe Folk Village is made up of 9 tile-roofed noble houses or hanoks and 29 thatched cottages. To be able to beat the day tour buses (even on weekdays!) and to experience the old hanok interiors, we booked in advance to stay at the largest hanok and registered cultural heritage, Bukchondaek, built by the provincial governor Ryu Doseong in 1862 and owned by the same family ever since. We had the privilege not only to eat, sleep and stay inside the hanok but also to have a private tour inside the oldest part of the hanok by the owner himself. The interior furniture and items are well kept and it felt as if we were seeing items which wouldn't be out of place inside a top history museum but which were still kept in their original place and state. 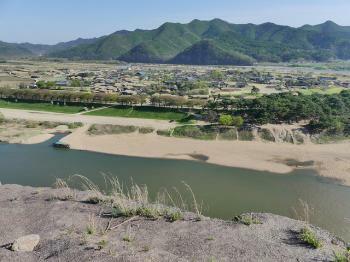 There's an old tree which grew with the same S shape of the Nakdong River, for which the village of Hahoe is named. My favourite item was the folk hat container and my favourite room was the Bukchonyugeo with heated wooden ongol floors and 12 panel windows which enables the hall to be converted in 4 separate rooms. It reminded me a bit of the great Rietveld Schroeder House in Utrecht. Needless to say, we would have missed all this hadn't we stayed overnight as only the courtyard is visible from the main entrance for non-guests. Early in the morning before breakfast we explored the small sleepy town. Apart from "our" hanok, we visited the head house of the Musi family, the traditional houses of Chiamgotaek and Okyenjeongsa, the head house of the Gyeongdang Family and Samsindang, a 600 year old zelkova tree which is worshipped as a village spirit. On the 15th of January each year, villagers perform a ritual here to pray for peace in the village. Close to the straw thatched houses is a roof-tiled church too. There are 2 small UNESCO marble markers at the lane of cherry trees just next to the ferry point and a bigger UNESCO stone marker just next to the tourist information before entering Hahoe proper. At around noon we visited the Mask Museum and carefully read the meaning of the different masked dance drama scenes. This came in handy at 1pm as we headed towards the Hahoe Byeolsingut Talnori theatre to see the masked drama performance (in Korean). Overall we really enjoyed our visit especially thanks to our Hanok stay and private tour. Before leaving, we ended our visit in style with a panoramic view of Hahoe (photo) from the 64m high Buyongdae Cliff (after a short uphill hike from the Hwacheon Seowon). Yangdong and Hahoe Folk Villages are traditional and historic Korean villages mostly occupied since the Joseon Dynasty. 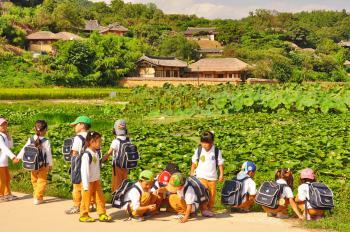 For now, I have only visited the Yangdong village, located 16 kilometers of the historic city of Gyeongju. 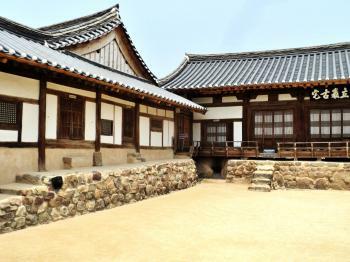 Korean aristocracy was living here under the Joseon Dynasty. 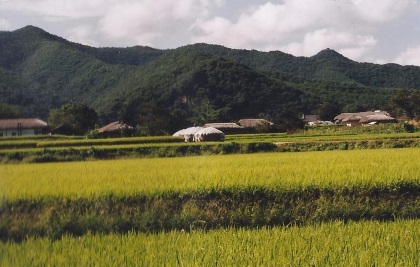 The village comprises several Korean National Treasures. Although some part of the village are unoccupied nowadays most of the folk homes are still used. Fifty-four historic homes are more than 200 years old. Mostly located on the side of a hill and on the bottom, this village is a fine example of Joseon Dynasty architecture and traditions. To get to this village, take one of the several different buses going from Gyeongju bus terminal to Yangdong village in almost one hour. I must admit when I first arrived at Yangdong I was distinctly unimpressed. Bus 203 dropped me off in a rather muddy car park and I was left looking through the drizzle at some tour groups walking around a cluster of wooden houses on a small hill. I walked around these houses for a couple of minutes and wondered if this was all there was to see. Fortunately a friendly local gave me a map of the village and I realised it was actually much larger, so off I trotted over the hill to investigate further. I enjoyed looking into some of the houses that were open and visiting the ‘Folk Treasures’ Seobaekdang was my favourite. All in all it was a pleasant place to stroll around and relax but there was not a huge amount to do. This was the second "folk village" I have visited from the World Heritage list and I was left with a similar feeling that I had after calling into Holasovice, it is nice that there are some representations of low key rural life on the list (even if this particular village was more for the rural elite) however they are not the most impressive places to visit. I visited Yangdong on a morning sojourn from Gyongju and it was a nice trip. There is now a direct bus that runs up there from the city centre every 90 minutes. It seems that the village is transforming into more of a tourist destination and at times can feel a little too restored. I doubt I would have made a trip here if it wasn't for its place on the list, but it did let me see something of traditional life in rural Korea. During my short trip to South Korea, I have a chance to revisit Gyeongju and its two UNESCO protected sites, Bulguksa Temple and Gyeongju Tumuli Park; however my true highlight was a visit to Yangdong, a small village outside the city of Gyeongju, together with Hohoe became the third world heritage site of Gyeongsangbuk-do Province, one of the cultural hotspot of this country. By a nice direct bus no. 203 from the Sin-Gyeongju Train Station or the central bus terminal, I was in Yangdong within 40 minutes. The first thing I saw was the large parking zone, with five tourist buses, clearly Yangdong was already being on tourist itinerary. The village itself is beautiful with many lovely thatched roof houses, paddy rice fields, lotus ponds and blooming flower, one of the prettiest places in Korea. Strolling around the village is a thing to do, as the village has unique characteristic as the tiled roof house of the ruling class will be on the top of the hill, while the lower class thatched roof houses are built on the ground below; however most of the houses are still occupied by local people, few are opened for sightseers, but I loved these things, the village is still a living place, not a fake traditional villages which Korea has a lot and also Yangdong does not have ticket for entrance yet. I don’t know what will happen with Yangdong in the near future, the site has potential to become a new tourist trap with many traditional houses turned to be souvenir shops and restaurants or café similar with traditional villages in China and Japan. The development of the fragile place is truly depending on locals’ decision. But at least in 2011, Yangdong is a lovely place to visit and a good World Heritage Site of South Korea. I visited Hahoe village in June. Hahoe is probably the best preserved Joseon dynasty village in Korea. I really enjoyed my visit here. 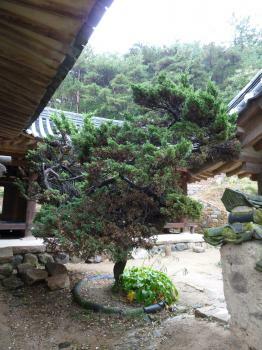 I had just recently visited Oeam and Naganueopseong village, which are on Korea's tentative list. So it was useful contextually for me to analyze each village on its own merits. 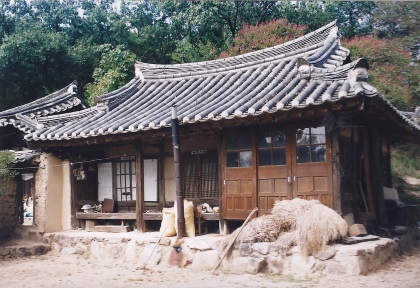 They are actually fairly different, and each provide a unique view into the traditional village life during the Joseon dynasty. Hahoe is set in a beautiful location, nearly surrounded by the Nakdong river, while rice paddies surround the back of the village. Like many of Korea's WHS this site may not "wow" you, but it is a beautiful place with important historical value. Joseon's Confucian Aristocrats (Yangban) & the Royal Family did not seek to make enormous grand structures, instead they sought greater harmony with man and nature. In addition, one can view Joseon architecture through the lens of Confucianism which places a strong emphasis on elegant simplicity. This is evident in Hahoe, Jongmyo, Changdeokgung, and the Royal Tombs. Preferably, arriving to Hahoe early or in the evening on a weekday would be ideal. Based on reports of very busy weekends, to experience the serenity of the village and not a bus load of fellow tourists, a bit of research may be fruitful. Some buses from Andong do stop at the nearby Byeongsan Seowon (part of this WHS) for a short time, but time restraints and infequent transportation made this too difficult during my visit. 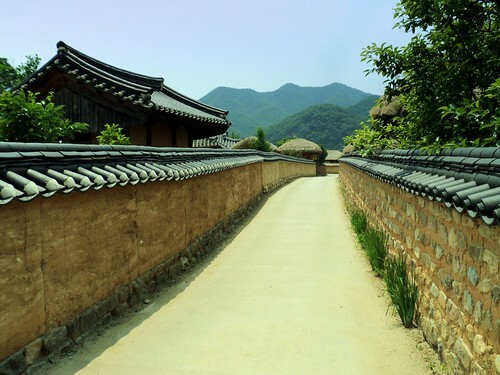 ICOMOS advised Referral to "Put in place a coordinated management system for the two component sites"
Cultural sites connected to Cliffs: Hahoe and Yangdong "Gyeomamjeongsa Study Hall was built in 1567 by Ryu Ul-lyong. Set on the western end of the Buyongdae Cliff it is framed by pine forest, and has picturesque views out over the Hwacheon Stream to the hills beyond." "Wonjijeongsa Study Hall was built in 1576 by Ryu Seong-ryong on the edge of the river for his own study and for teaching. It consists of a study hall and an elevated square pavilion, from which there are views out across the river to the pine forests of Buyongdae Cliff and beyond to Mount Wonjisan." Literature: Hahoe Village: Criterion (iv): The villages, and particularly the ensemble of yangban and commoners' houses, and their overall and individual planning, reflect the precepts of this Dynasty in terms of its social structures and cultural traditions as well as its power and influence and its literary, and philosophical traditions. Memory of the World: Confucian Woodblock Prints (2015): The Confucian Academies in Korea, particularly in North Gyeongsang province played a huge role in the publication, storage, and gathering of . Inscribed within the Historic Villages of Korea WHS - Byeongsanseowon Confucian Academy - Oksanseowon Confucian Academy - Donggangseowon Confucian Academy The current collection is now housed in Andong, it used to be largely stored in the Confucian Academies themselves. On T List for a different nomination: Byeongsanseowon and Oksanseowon Confucian Academies were inscribed in 2010 as serial components and are also part of the seperate nomination Seowon, Confucian Academies of Korea.